July 30th is National Cheesecake Day and what better way for this sugar cookie lover to celebrate than with a sugar cookie cheesecake! Instead of a graham cracker crust, I used baked (homemade) sugar cookies and prepared them the same way you would the graham crackers for the classic crust. And in keeping with the sugar cookie theme, I mixed in a half cup of sprinkles to the classic cheesecake batter. :) There's no such thing as too many sprinkles, right? :) Adding them definitely pumped up the happy quotient! This sugar cookie cheesecake was a big hit at our house! It's simple to make and makes any day a celebration! Using a food processor, grind up cookies into fine crumbs for two cups of crumbs. In a bowl, mix together crumbs, butter and 2 tablespoons sugar until well blended. Press mixture into the bottom of a 9-inch springform pan. Bake for 10-15 minutes until done. Prepare pan for baking by covering the bottom (and continuing up the sides) of the pan with heavy duty aluminum foil. Place cream cheese in the bowl of a stand mixer, and beat until creamy. Add the eggs, vanilla, sugar and mix well. Pour the mixture into the springform pan and smooth out evenly. Sprinkle some jimmies and crystallized sugar on the top of the cheesecake. the cheesecake will be slightly golden and set, but will jiggle in the middle just a bit. carefully remove from the springform pan. Roxana (Roxana's Home Baking) organized a huge cheesecake event for today with over 60 bloggers participating! Click on the links below to discover an amazing array of cheesecake recipes! Thanks, Roxana! So fun with the sprinkles. I LOVE IT :) Pinned! This has to be the cutest cheesecake ever! 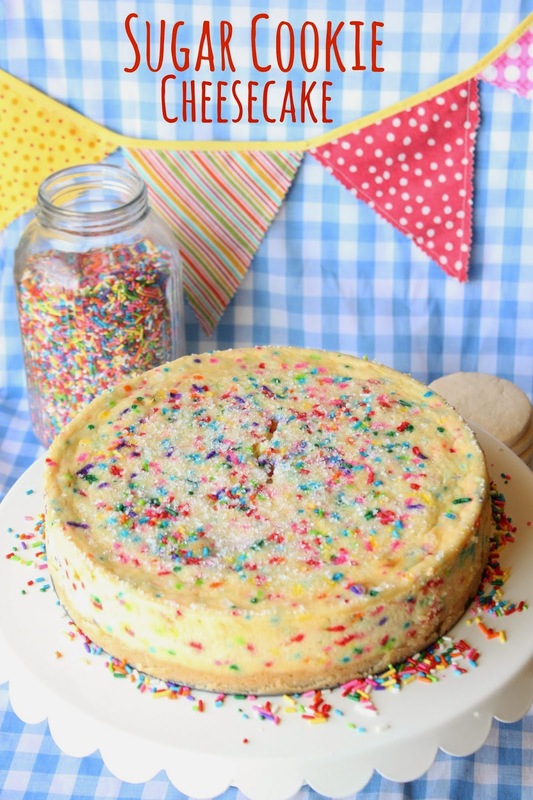 Love the fun sprinkles and the sugar cookie crust! oh my it looks so cute! loving all the colored sprinkles! I bet it tastes so good too! YES! I'm in love. Sugar cookies are my jam. Pinned! What a fun, yummy cheesecake! LOVE it! Such a fun cheesecake! My daughter took a quick peak and not she sings in the house "sprinkles makes me happy"
That's so cute about your daughter:) Thanks for the invitation and all your hard work it putting this together, Roxana! It's been fun! I love everything about this cheesecake. From the sprinkles to the sugar cookie crust, it's so pretty and festive. Just beautiful! This is probably the most fun cheesecake ever. I love that you choose a sugar cookie cheesecake - it's beautiful!! So many recipes in one place - wow!! Um I love this. So perfect!! Yep, sprinkles make everything 100 times better. This is fab! It looks so pretty with sprinkles! Sprinkles make everything pretty:) Thanks, Angie! How pretty, how creative!! That would be so perfect for a birthday celebration, amazing!!! Thanks, Tara, I think so too! I am LUSTING over this adorable cheesecake! It's so much FUN! That cheesecake looks so fun and tasty. perfect for party with friends or family. Wow! This is so creative and fun! my kiddo would go nuts for all those sprinkles! Wow Sue, this looks freaking amazing, and that sugar cookie taste in a cheesecake? I love cheesecakes anyway, but this, yes this, I can definitely get on board with. Stunning too. Pinned. 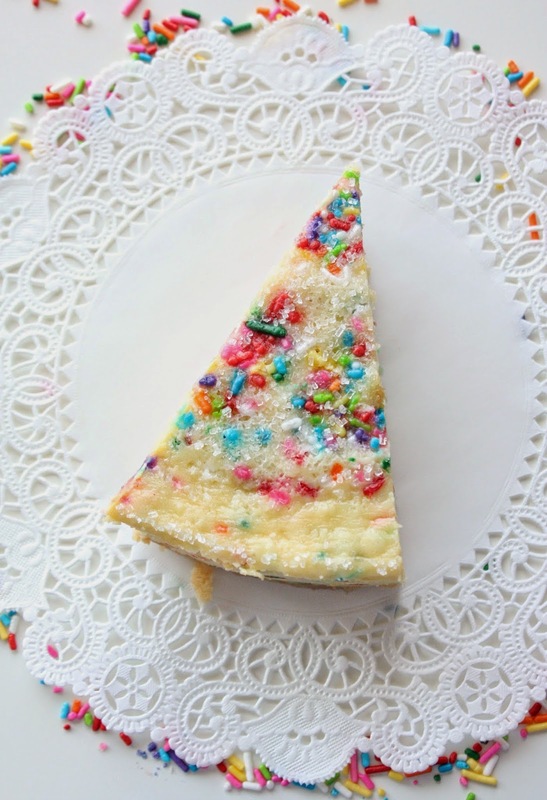 Such a great idea for a cheesecake crust and the sprinkles was another great idea! P.S. Apologies for my serious lack of posting recently... life has been crazy busy but I really hope to post soon! No worries, Hazel:) Thanks for your comment! Just a quick question to I prepare the pan with aluminum before I bake the crust without the filling? or after the filling is added? Hi Amanda, It should be as smooth as you can get it. :) Have fun! If, i didnt want to make cookies from scratch , about how many cookies would it be? Well, it depends on the cookie size, but you need enough to make 1 1/2 to 2 cups of crumbs. With a classic graham cracker crust, it takes about 10-12 full graham crackers to make 1 1/2 cups, so you can go from there in your figuring. Hope this helps.